Michael Jackson's personal physician has been called inept, frantic, distracted, self-serving and irresponsible during testimony from 33 prosecution witnesses in the doctor's involuntary manslaughter trial. 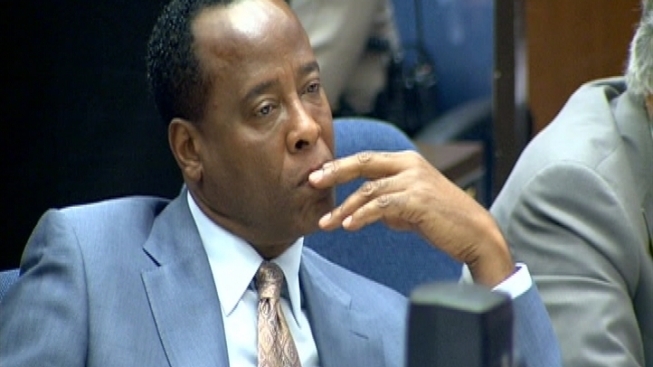 On Monday, Dr. Conrad Murray's attorneys began countering those claims with testimony from their own witnesses, including a long-time Jackson doctor who met with the superstar in April 2009 -- about two months before Jackson's death. Dr. Allan Metzger testified about his relationship with the pop star. "It began professional, and over the years we had become close over the birth of his children," said Metzger. "In many ways, I was a confidant and a friend." Jackson did not mention any other doctors when he visited Jackson's home in April 2009, Metzger said. Metzger described Jackson as "lucid" and "excited." "He spoke to me about his excitement and fear about the (This Is It) tour," Metzger said, referring to a series of upcoming London concerts. "I think his fear was this was a big obligation. He realized it was a huge ordeal to do that. He believed he was up to the task, but also fearful about his nutritional state and staying healthy." Metzger said he realized sleep, particularly after performing, had long been an issue for Jackson. The last witness to take the stand Monday afternoon was Cherilyn Lee, a nurse practitioner, who testified she treated Jackson for sleep issues using a holistic approach. Lee said that the superstar was healthy and that his vital signs were normal, and that she believed his sleep issues had to do with Jackson drinking a lot of highly caffeinated drinks. "He drank a lot of Red Bulls," Lee said. Earlier Monday, the defense called Detective Dan Myers, who interviewed the first guard to reach Jackson's bedroom at a rented Holmby Hills mansion on June 25, 2009 -- the day the superstar died. Guard Alberto Alvarez testified during the first week of the trial that Murray ordered him to stash several vials of medicine in a bag and remove Jackson's children from the room before telling him to call 911. Myers testified that Alvarez did not tell him that Murray asked him to hide drug vials. Alvarez admitted under cross-examination that, on the day Jackson died, he did not tell police that Murray instructed him to remove the vials. "They're trying to pick apart little parts of every person's story," said legal analyst Justin Sander. The defense began with testimony from Dona Norris, a member of the Beverly Hills Police Department, who testified the department initially received the 911 call at 12:20 p.m. on June 25, 2009. Jurors also heard from a surveillance specialist who collected video of events outside the singer's rented mansion the night before Jackson's death. Alexander Supall told jurors he collected a few minutes of video around the time Jackson and his entourage arrived home after a rehearsal for his comeback tour. The defense case might wrap up late this week. Attorneys expect to call about 15 witnesses. As the trial nears a close, Jackson sister Janet Jackson announced she will reschedule a series of concerts in Australia to be with her family in Los Angeles. Before the prosecution rested its case Monday, Murray's attorneys finished questioning a key prosecution drug expert who has been on the stand since late last week. Dr. Steve Shafer's scathing criticism of Murray's care for Jackson began late last week. He claimed a series of errors, including Murray's failure to provide proper monitoring equipment at the rented Holmby Hills mansion where he was caring for Jackson, led to the pop superstar's death. Most of Shafer's testimony focused on event during the early morning hours of June 25, 2009. But he said Monday it's difficult to know the exact impact of propofol on Jackson because so much had been administered in the months before his death. "There's very little, almost no precedent for this level of propofol exposure," Shafer said under cross-examination. Shafer is considered a leading expert of the drug blamed in Jackson's death -- propofol. In an interview with Los Angeles Police Department investigators two days after Jackson's death, Murray said he gave the superstar the powerful surgical sedative after Jackson pleaded with him for something to help him sleep. Prosecutors played that two-hour interview for jurors earlier in the trial, and it's likely that will be the only time jurors hear from Murray -- the Houston-based cardiologist probably will not be called to the stand. Defense attorneys will probably call on police detectives, character witnesses, their own propofol expert and other medical experts to make their case. The defense is expected to argue that Jackson self-administered the fatal dose of propofol when Murray was out of the bedroom June 25, 2009. They also might argue that Jackson swallowed several pills of the sedative lorazepam. Murray has pleaded not guilty. If convicted, he faces up to four years in jail and loss of his medical license. Court is scheduled to resume at 9 a.m. Tuesday morning, 15 minutes later than usual. Text Alerts on Your Phone: Click here to sign up for breaking news and other text alerts from NBCLA.